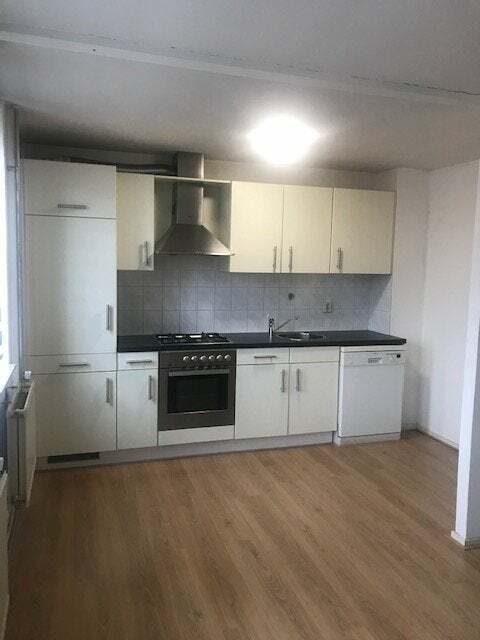 Very spacious top floor apartment, conveniently located for shopping facilities on Franz Leharplein, near the High Tech Campus and ASML and within cycling distance of the city center. The shared entrance is accessible via a tiled front garden. Hall with meter cupboard. Stairs to the top floor through your own door. Portal with access doors to kitchen, living room, dining room and bathroom. Entire apartment has laminate flooring. Open kitchen with 4 burner gas stove, combi oven, extractor hood, fridge, dishwasher and ample storage cupboards. Bright living room with 3 spacious windows with tasteful blinds. Adjoining dining room / TV room with 2 windows on the street side. The adjacent bathroom has white tiles, sink with medicine cabinet, shower, toilet and window. Access to 2 spacious bedrooms ± 12m2, both with skylight. Storage options under a sloping roof. Storage cupboard with central heating boiler from 2007. At the rear of the house access to shared bicycle storage.